The World Cup is rapidly coming to Brazil. The protests are already there. Dave Zirin has a book out next week called Brazil’s Dance with the Devil: The World Cup, the Olympics and the Fight for Democracy. His travels to Brazil and work on that project inform much of this article. This belief that the lion’s share of Cup expenditures are for foreign consumption, while the disruption and pain will be shouldered by Brazil’s masses, is widespread. Every protest, every rally, every cry of despair is connected to the “the three D’s’”: displacement, debt and defense. The stats on displacement, debt and defense can be numbing or easy to disregard for outsiders. The numbers on people expelled from their homes vary wildly, but without question, hundreds of thousands of the most vulnerable residents in the country have been or will be relocated by either carrot or stick, whether through financial reimbursement or through the barrel of the gun. As Brazilians suffer these unprecedented disruptions into their lives, the words of those in charge could not be more tone deaf. Brazil’s Sports Minister Aldo Rebelo huffed in March that any anger would dissipate by the time the Cup was underway, saying, “People will be more concerned with celebrating rather than protesting.” FIFA General Secretary Jerome Valcke seemed to pine for the dictatorial Brazil of yesteryear when he said that “working with democratically elected governments can complicate organizing tournaments.” The foot-in-mouth Valcke also commented recently that FIFA has been “through hell” trying to keep the World Cup on schedule. It is safe to guess that the “hell” of having your home bulldozed or being beaten and gassed by police is slightly worse than anything Valcke has had to endure. The calls for protest aim to highlight the pain as well as show the world who is behind the curtain, pulling the strings. There is a highly sophisticated awareness that just as the government’s World Cup plans for Brazil are designed for international consumption, there is also an unprecedented global spotlight. The great journalist Eduardo Galeano once wrote, “There are visible and invisible dictators. The power structure of world football is monarchical. It’s the most secret kingdom in the world.” Protesters aim for nothing less than to drag FIFA from the shadows and into the light. If they are successful, it will leave a legacy that will last longer than the spectacle itself. 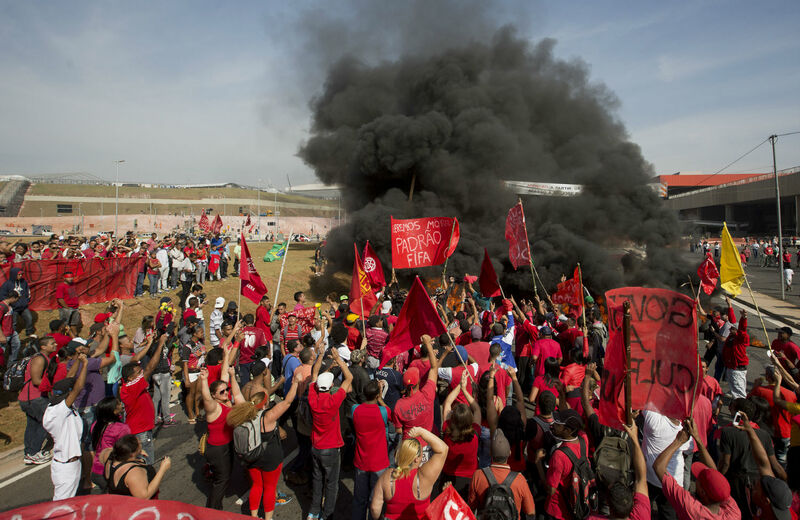 "It's almost impossible to keep track of the wave of strikes and demonstrations taking place across Brazil, and it will only heat up more as the World Cup approaches. There were scenes of chaos across Brazil yesterday as the 'There Will Be No Cup' movement was repressed with tear gas and rubber bullets in major World Cup cities. In São Paulo, ten thousand public schoolteachers, who have been on strike for three weeks, marched to City Hall. Meanwhile, the Homeless Workers Movement (MTST) joined forces with the Landless Workers Movement (MST) and blocked highways near the Itaquerão stadium, where the opening game will be held, as well as in the west and south zones of the city. In Recife, which will host five games, the military occupied the streets with tanks as a strike of the police and firefighters entered its second day. Teachers are also on strike in Rio and Belo Horizonte, both Cup cities, and their unions officially joined the anti-Cup protests. Rio was paralyzed by a wildcat bus strike for two days, while subway workers in São Paulo are threatening to do the same. The list goes on: oil workers in Cubatão, armored car drivers in São Paulo, civil servants in Belo Horizonte, airport workers in Guarulhos, just to name a few. There have even been protests at Brazilian embassies abroad. Many Brazilians have fallen out of love with the World Cup after seeing the destruction it's caused. The word 'FIFA' is about as popular as 'FEMA' in New Orleans after Katrina. A web poll at Veja magazine showed that only 22% of readers would root for Brazil, while 34% planned to root against. Everyone has commented that the traditional pre-Cup festivities — painting the streets, hanging up green and yellow bunting — is hard to find this year. In a poor neighborhood in São Paulo, one woman commented, 'The city hasn't even sent milk for our kids yet. How am I going to paint the street?' Another added, 'My children have a fever and there's no doctor to attend them. I can't think about the Cup in this situation.' But Brazilians haven't forgotten about the protests last year, and the last few weeks have shown that the action off the pitch will be just as intense, and much more decisive for Brazil's future, than the action on it."